Sound "'Crisp, clear, clean and superbly delineated'" -- "have a high-level of 'see-through' transparency that you normally associate with much more expensive speakers"; "the low end lacks high-level output," but the bass "is surprisingly extended." 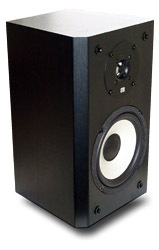 Features No crossover element for the woofer, which rolls off on its own; asymmetrical cabinet walls reduce internal standing waves; Vortex corrugated port offers "more volume for the same diameter." Use Doug found the speakers easy to place for good sound, but putting them closer to the walls will surely increase bass response. Value "I find myself going back and listening to these speakers in favor of some much more expensive ones!" Im in a quandary. On the one hand, I know that you get the biggest audio bang for the buck with loudspeakers. As one dealer I know likes to say: "You pay more, you get more." And for the most part, particularly when it comes to speakers, hes right. Up to a limit, Ive found that you generally get a greater incremental increase in sound quality for a specified amount of money spent on speakers than with that same amount of money spent on other components. So I believe in building a system around a set of loudspeakers -- match the cables to the amp and the speakers you want to use them with. Balance is an obvious key, but to my mind, speakers make the biggest impact. However, Im really in a state of disbelief because these little $275 USD Axiom speakers have no right to sound as good as they do. In fact, I find myself going back and listening to these speakers in favor of some much more expensive ones! Whats more, Im using electronics that cost more, sometimes much more, than the speakers. And therein lies the problem. Am I to tell people to sell their more expensive speakers and buy these Millennia 3Tis? It doesnt make sense! Luckily, the matter is not quite as simple as selling existing speakers to buy new ones, which we audiophiles do all the time, because there's a little more to it. The Axiom Millennia 3Tis are not the perfect loudspeakers. And yes, you can do better spending more money. But the 3Tis are such astonishingly good-sounding low-priced speakers that do so much right, I urge you to read on. If youre on a budget, or if you need a second set of speakers, or if you have some extra cash hanging around and want to blow it on a pair of speakers instead of a pair of interconnects (and we all know what you can pay for interconnects), then the little Axiom speakers are worth considering. They are an outright steal for the money. The M3Ti is the largest bookshelf speaker in the Axiom Audios Millennia series. There are two smaller and less expensive models below it. The M3Ti features a 6.5" aluminum woofer and 1" titanium-dome tweeter (hence the Ti). However, the M3Ti adds a few wrinkles to the standard tweeter-on-top-of-the-woofer bookshelf-speaker configuration weve seen bazillions of times before. First off, there is no crossover element on the woofer -- it runs free and clear and then rolls off gently. Essentially, in order to minimize complexity of the design, the company chose to use the woofer's natural mechanical roll-off characteristic to achieve integration with the tweeter. The cabinet has asymmetrical walls -- meaning non-parallel. So if you look at the speaker from the top, you will see that the back panel is narrower than the front, so the side walls angle in toward the back. They do this to reduce internal standing waves and eliminate the need to "stuff" the speaker with damping material. Finally, flip around to the back of the speaker and you see Axiom's Vortex port, which is corrugated around its sides. This unique design characteristic gives the port more volume for the same diameter. The speakers are rated at 93dB in-room efficiency, which is likely a little generous. Still, they are very easy to drive and didnt give any amplifier I used a hint of problems. Impedance is rated at a nominal 8 ohms. The cabinet is wood-like vinyl veneer over MDF. The fit and finish are very good and outclass those of much more expensive speakers. Veneering and edges are flawless. How does Axiom do it when some companies making speakers costing many times the price cant achieve the same level of quality? Simple. Axiom may be a new name to some, but theyve been around for 20 years and make many speakers in a single day. Ive visited their factory, and they have plenty of high-tech machinery and therefore enjoy economies of scale in production. I talked briefly with Ian Colquhoun, Axiom's president and chief designer, about what he goes for in his designs. "Its actually the family of curves," he says. He then went on to explain that what he feels makes a speaker sound good is a combination of the on- and off-axis response curves and their correct balance. This is not new news. Colquhoun was one of those involved back in the 80s with Floyd Toole, Paul Barton, Ian Paisley, and a bunch of others at the National Research Council in Ottawa. The way a loudspeaker disperses its sound in a room, they all found, is crucial. Given the speakers design heritage, it is no surprise that placing it in the room was quite simple. I had the pair a couple feet from the side walls and a little over five feet from the rear wall. While this worked well for me, the distance from the rear is something a prospective purchaser should play with. I achieved excellent imaging and soundstage depth, but sacrificed some bass extension due to a lack of reinforcement. Moving the speakers back will increase the bass. I used the 3Tis with a variety of electronic components of all price levels: Blue Circle Audio BC2 amps and BC3000 preamp, Redgum RGi120 integrated amp, Resolution Audio CD55 CD player, Vecteur L3 integrated amp, Audio Aero Capitole 24/192 CD player. One of the most peculiar things I did was connect the speakers and electronics with Magnans astoundingly large Signature speaker cables -- they weigh more than the speakers and cost almost four times as much! Blame it on the stupid audiophile in me, but the combination sounded good. Of course, you dont have to go to these extremes; many reasonably priced cables will work just fine too. The characteristic that so impressed me with these low-priced speakers is their clarity and resolution, particularly in the crucial midrange area. They have a high-level of "see-through" transparency that you normally associate with much more expensive speakers. "Crisp, clear, clean and superbly delineated" is what I jotted down in my listening notes. The Millennia 3Tis possess an even tonal balance, no bloat or exaggeration, and most importantly, no overly warm, woolly character that can plague lower-priced speakers. The M3Ti is easygoing in the midrange and non-mechanical overall, which are two of the reasons I like listening to them so much, although Paradigms excellent $189 Atom sounds a tad more subdued in high frequencies. The M3Ti also has fine retrieval of detail -- perhaps due to the absence of crossover components. Bass is surprisingly extended given both the size and the price of the 3Tis, but it is also the only real caveat: the low end lacks high-level output. The bass is tight, detailed and surprisingly deep (the speaker sounds in-room like it extends to below 60Hz, which is sufficient for most music), but when the speakers are cranked too high, the bass can sound a bit congested. Despite its overall proficiency, it is still a small speaker. Still, the M3Ti will play all kinds of music, including rock and orchestral pieces, at "sane" listening levels. Just be warned that this is not really a "party" speaker on its own, nor is it a speaker for a large-sized room. If thats what you need, Axiom does offer larger speakers based on the same technology, subwoofers too. I hope to hear one of the company's floorstanding models in the near future. When playing any variety of music the Millennia M3Ti casts a credible soundstage with good left-to-right precision and a fine sense of depth. No, it can't quite do the hologram thing like NSMs Model 5 and 10S, but it does do as good a job as some much more expensive speakers. And it doesnt have the effortless dynamics that something like the unbelievably expensive JMlab Mini Utopia has (and if it did, this speaker would be the bargain of the century). But while the Millennia M3Ti cant do everything, I never had the feeling that I was missing anything substantial, and I would expect to pay a whole lot more for this level of sound quality. So far Ive told you that the Millennia M3Ti has a nicely balanced midrange -- a notch recessed perhaps, which also helps to give it an increased sense of depth and that relaxed feel -- a well-extended and clean top end, and suprisingly good bass given its price. Still, saying these doesnt do much to tell you why I went back time and time again to listen to these speakers. Frankly, its hard to put my finger on, but Ill try. This little fella isnt perfect, but what seems to make it so special is that from top to bottom (within its limits) it is ideally balanced. It is not deficient in any substantial way, has nothing but strong performance across the board, and perhaps just as importantly, it also doesnt have any noticeable anomalies that jump out at you and then fatigue you during long-term listening (a tipped-up midrange, laid-back top end, or what have you). Balance is the key with the Millennia 3Ti. The M3Ti is a great inexpensive loudspeaker that brings high-quality sound down to a ridiculously low price. Its not the only speaker of its type -- Paradigm and PSB have some models that do the trick too. But line this one up alongside because it is wholly competitive. When you listen to this speaker, you will hear a surprisingly refined product that may trick you into thinking it is more expensive than it is -- waaaay more expensive. To me, this speaker is a true find. Try it, buy it, and if youre embarrassed to tell someone how much it cost, spill the beans anyway. You'll look like an audio genius. Price: $275 USD per pair.